Threepointplay: Mailday...the first in three years! On Saturday morning, the first cards that I have purchased in just over three years landed on my doorstep. Now it is fair to say that the cards themselves are not particularly earth shattering, but they did only cost $25 in total after all. But from my perspective, it officially marked my re-entry into the hobby that is basketball card collecting. 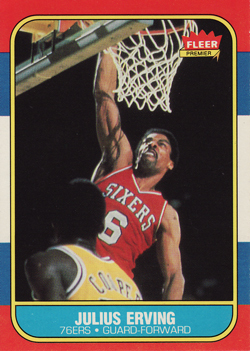 First up is a Julius Erving (aka Dr. J) card from the iconic 1986-87 Fleer Basketball set. Pretty much all that needs to be said on this set has already been said, so I should probably quickly move on to why I bought this card myself. 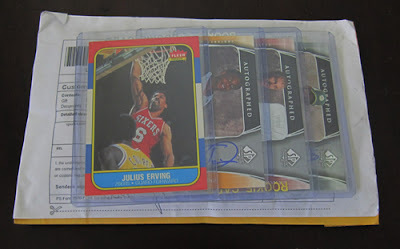 In Spring 2008, I purchased a partially completed set, that consisted of the majority of the common cards, but excluded the main RCs (inc. Michael Jordan, Charles Barkley, Karl Malone & Hakeem Olajuwon) as well as a few stars such as Larry Bird, Magic Johnson & of course the Julius Erving one. I subsequently then spent the next year steadily picking up the missing cards. Whilst I also purchased a completed sticker set from the same release, the set was seven cards short of a complete set, before I took my hiatus front the hobby in mid-2009. The addition of the Erving reduces that number by one. Completing this set is top aims for the next few months. The [almost] complete set, that includes a graded version of the Michael Jordan RC and the sticker set can be seen here. The other three cards are lower end RCs from the 2005-06 SP Authentic release. 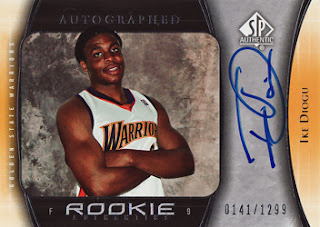 Whilst on holiday in California in 2006, I bought a box of this release from a Los Angeles hobby store. 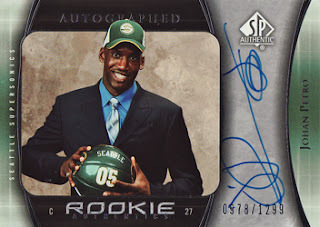 The box provided me with a complete base set, but still a lot to do on the rookie cards, as there was over 60 short printed of them in the set. At last count I still have 20 left to find, so I probably need to make a bit more of an effort complete this set. Of the three players, only Frenchman Johan Petro is still in the league. He seems to be carving out a steady career for himself as a back-up center and is currently with the Nets. I have seen little of him, but as I have tickets for one of the quarter- final days may get to see him first hand at this years Olympics representing France. Ike Diogu, a journeyman forward who played for seven teams during his seven years in the NBA, can now be found plying his trade in China. 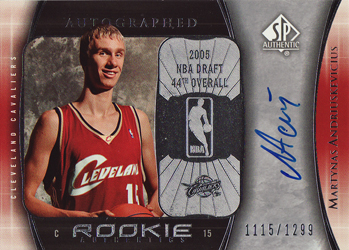 Finally, Arvydas Andreiuskevicius a 7'2" Lithuanian center, who was the 44th pick in 2005, has yet to make a start in the NBA. It also looks as though he has fallen out of the Lithuanian national team. All of which I would not have learned, unless I had purchased the above cards. Clearly it is utterly useless information, but it is one of the reasons why I enjoy the hobby...reading up on players as their cards arrive on my doorstep!